WHD Mould:Home Appliance Moulds, Automotive Part Moulds, Motorcycle Moulds, Special Moulds, Construction Moulds, Commodity Moulds, and other plastic moulds. High speed industry blowing machine, which is used for venting, cleaning and drying stand for air compressor, can save energy of 80%, About 2-6 RMB per hour. 5. Independent cycle of power. This product is for testing water cooling system of mould, with 7 kind of functions, easy operate. 1. Check if any block on water cooling system, alarming if blocked. 4. Check if any leaking, alarming if leaking. 5. Cleaning water after checking. 6. Visible window with data of water volume. 7. Note after completeing testing. The product is developed for testing ejection system of mould. 4. Easy connector of T style. This product can offer different 5 channels for oil volume. 1. Different channels to fit different demands. 2. Low speed can save life of oil pumper. 3. Oil will not be easy ejected when EDM. 4. Clean oil can improve speed of sparking with better EDM surface. 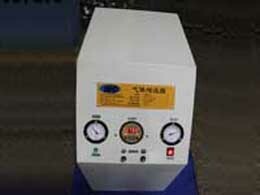 This product can add air preesure of air compressor to 8kg/cm, which can offer energy conservation. 2. Improve life of air pipes and air compressor. 4. Adjustable option for different pressure. ADD: Shenzhen City, Guangdong Province Shajing Town, Baoan District Whampoa blue sky Science and Technology Parks.